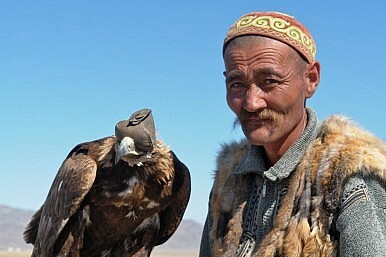 A Kazakh eagle hunter with his "bürkit" hunting eagle. Friday, some local sources claimed that Nazarzoda had been killed (link in Russian). RFE/RL reported that the authorities have not confirmed. Over the weekend, we might get more information. Read up on Nazarzoda to get a better picture of who the general is and what led up to the events of September 4. First check out Eurasianet’s profile of Nazarzoda. Then read Farangis Najibullah’s profile for RFE/RL, which goes deeper into explaining how Nazarzoda navigated the civil war and fit himself into the post-war peace arrangements. In another art-related story in Uzbekistan, the European magazine Cafebabel interviewed Umida Akhmedova, an Uzbek photojournalist and documentary filmmaker who was convicted in 2010 of “defamation” and “insult” related to a documentary she had made with her husband about rural life in Uzbekistan. The government said they “had discredited and disrespected the traditions and values ​​of the Uzbek people.” While Akhmedova was quickly released, life remains difficult for her as an artist in the country.